This Hanukkah we decided to do a recipe a bit out of the ordinary. Hannukah is synonomous with fried foods- latkes (potato pancakes) and sufganiyot (jelly-filled donuts) are about the only things we eat here for 8 days straight! So now, in the middle of this deep fried holiday, we decided to do a recipe with a touch of health, a load of bright colors, and still really tasty. We used baharat in this recipe- if you can find it, you can easily make it yourself. Check out the recipe here. 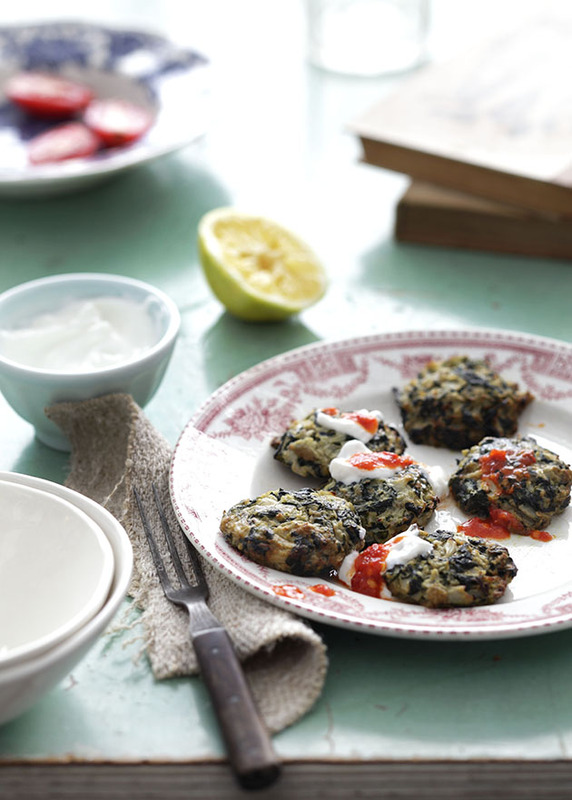 We used spinach for these latkes but you can replace the spinach with Swiss chard or kale. 1. Cook the cauliflower florets in a large pot filled with boiling water for 10 minutes, until softened. Strain and set aside to cool. Once cooled, chop the florets into fine pieces. 2. In a large pan, heat the 2 tablespoons of olive oil and then add the onion. Cook for about 7 minutes, until the onion is transparent. Add the garlic and cook for another minute and then add the baharat. 3. Add the spinach to the pan, each time adding a bit, until it wilts. Once all the spinach has wilted, remove the pan from the heat and pour the ingredients into a fine-sieve strainer. Strain until nearly all liquid is removed. 4. Heat oven to 400F/200 C. Line a baking sheet with parchment paper. 5. In a large bowl mix together the spinach mixture with the chopped cauliflower. Add the egg and breadcrumbs and mix well until all ingredients are combined. Add salt and pepper to taste. 6. Using your hands, make small balls about the size of ping pong balls and then pat them down a bit. Place on the prepared baking sheet. Continue with the rest of the mixture. Brush latkes with the 1/3 cup olive oil and bake for about 30 minutes, until golden. 7. Eat warm at room temperature. Serve with yogurt and hot sauce!